On the heels of a small stirling engine we featured, an astute Hackaday reader sent in a few awesome builds from HMEM, the home model engine machinist forum. First up is a fantastic looking stirling engine made entirely from scratch. The build is modeled on a Moriya Hot Air Fan, but instead of making a fan spin around, [IronHorse] put a flywheel on the engine. It also uses propane instead of an alcohol or other liquid fuel lamp for the heat source. Next up is a pee-wee sized V8 engine by [stevehuckss396]. Unlike the model engines we’re used to, this one runs on gasoline. The engine started out as a 3 x 3 x 5 inch block of aluminum. This thread goes on an amazing 85 (!) pages and makes for great afternoon reading, but here’s a video of the engine in action. Last is [keith5700]’s amazing 1/4 scale V8. Not only is this [keith]’s first project, he also completed this entire project on manual mills and lathes. There’s an electric starter thrown in there, and the pictures are simply incredible. Thanks to [Norberto] for sending this one in, and if you’ve got an example of amazing machining skill, send it on it to the tip line. Winter’s coming, and you don’t want to be outdone by your neighbor’s new snow blower. 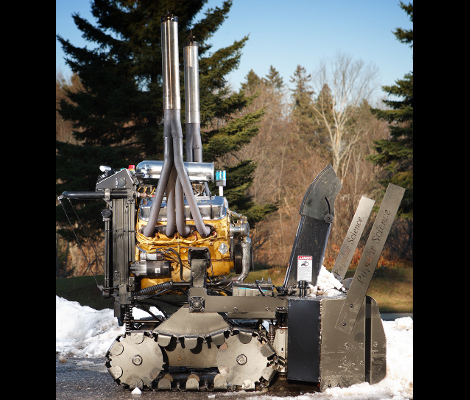 We think it’s pretty safe to say you’ll be the envy of gearheads throughout the neighborhood if you can build your own snow blower around a V8 engine. [Kai Grundt] is a metal fabricator by day and a horror movie prop yard implement builder by night. He pulled the engine out of his Chevy truck and then filled in parts around it to make this 412 HP snow blower. The tank treads that it rides are each have their own dedicated hydraulic pump, making it easy to drive and steer this 800 pound whale. One of the first orders of business for the beast was to throw snow from two houses away, burying his buddy’s car. That’s the price you pay for laughing in a guy’s face when he describes his next project. It sounds like [Kai] was planning on selling kits so you could more easily replicate the build, but we couldn’t find any additional info on that. If you’ve got the details, please let us know by leaving a comment.